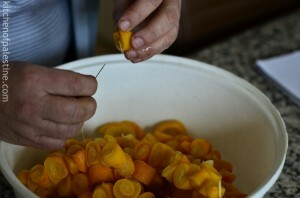 Today I’m so excited that I’m sharing with you one of most interesting marmalade recipes out there. 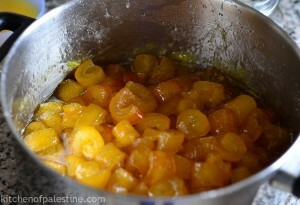 Although I’m not a big fan of citrus jams in general, but definitely this one is an exception. 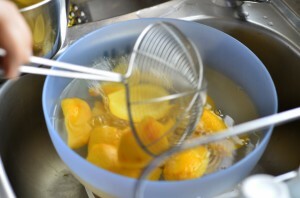 Bitter orange marmalade has a rich flavor and delicious taste with balanced combination of sweetness and bitterness. 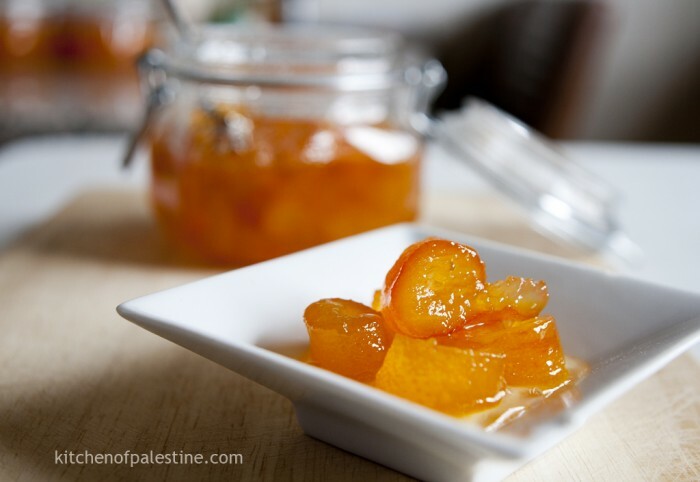 Bitter orange jam is a typical Ottoman dish which is widely known in Turkey as “turunç“. 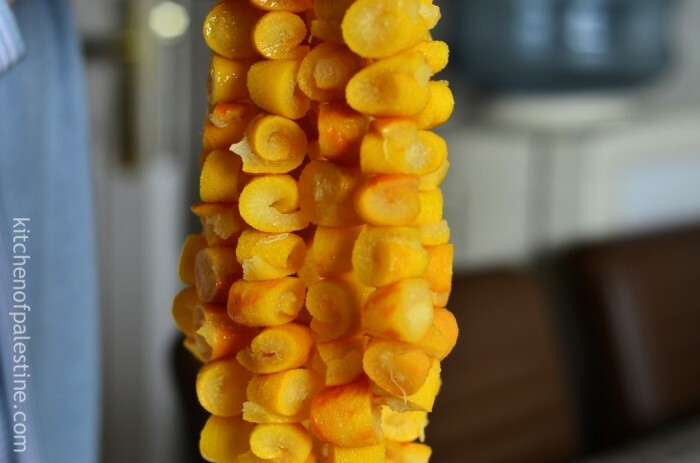 It is also known in Palestine but less commonly, where it’s called “mrabba khesh-kash”, “mrabba naranj”, or “zifer” as in Nablus. 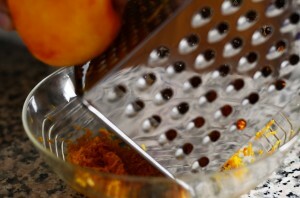 Use stainless steel mandoline to thinly shave off the very outer skin of bitter oranges. 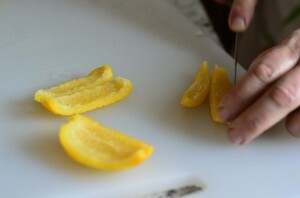 Peel each bitter orange into 5 to 6 slices from top to bottom. 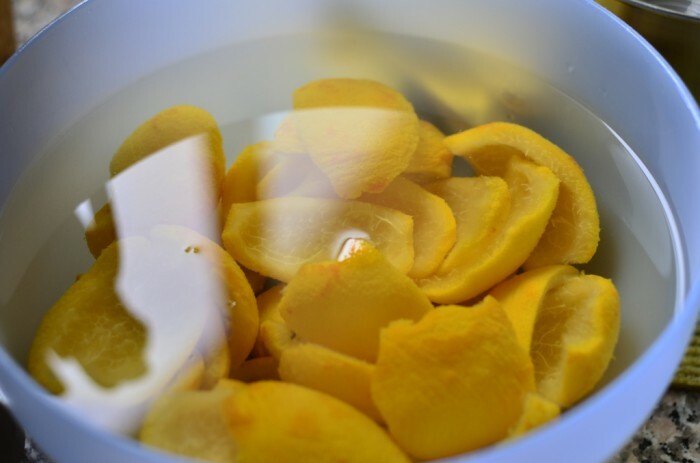 Put orange peel in a deep cooking pot filled with boiled water and leave them for 3 minutes over a medium heat. 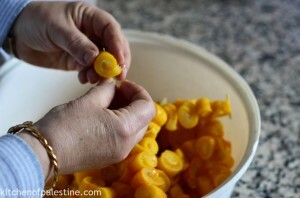 Take them off the pot and soak them in another bowl filled with cold water. Change the cold water four to five times within 24 hours in order to get the strong bitterness out of them. 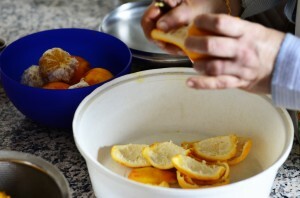 Cut each orange peel slice into two or three thinner slices. 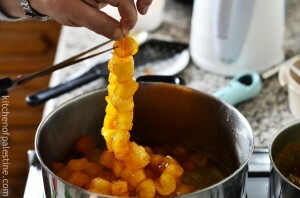 Wrap each peel slice to get the final form of rolled orange slices. In order to keep this form, place them in a long string using a steel needle. Knot the edges of the string together after having it filled with rolled slices. 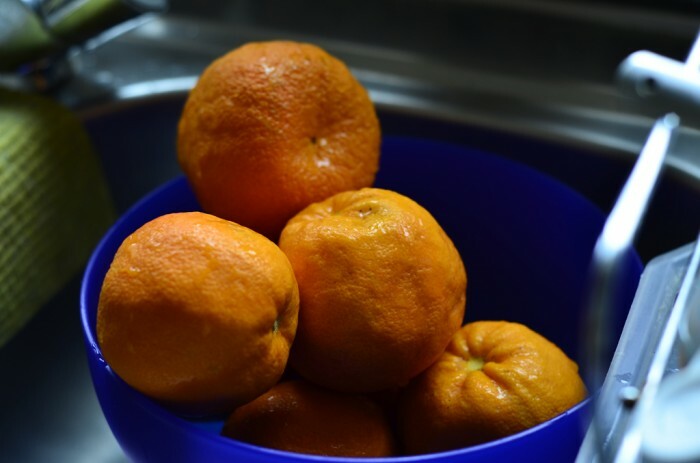 You might use three to five strings for this quantity of oranges. 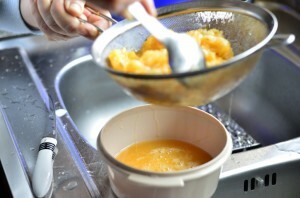 Place a cooking pot over medium heat, add 1/2 kg of water (about 2.5 cups) and sugar and stir for 5 minutes until sugar gets dissolved. 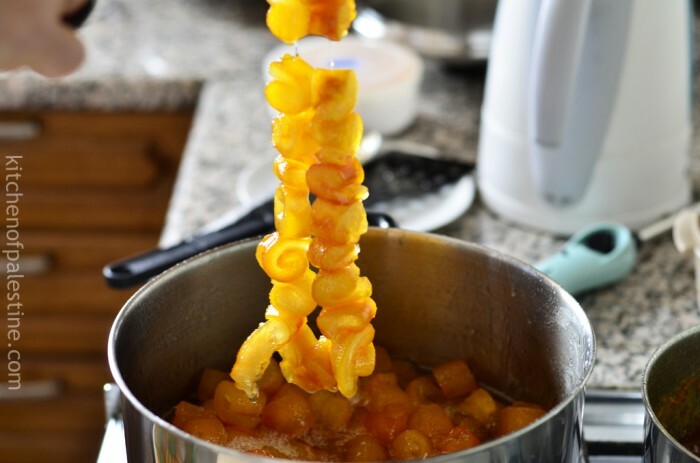 Add strings of rolled slices to the pot and leave them over low heat for about two hours while stirring from time to time until sugar syrup gets slightly thickened. 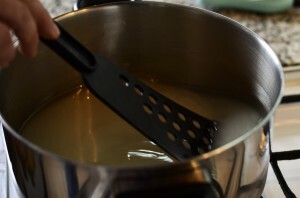 (Test consistency of sugar syrup by taking a spoon of it and cool it down, you should get slightly thick syrup not too thick). 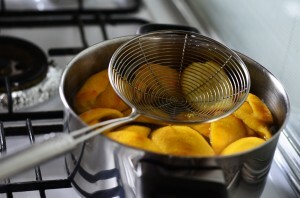 Cut strings off the rolled slices and then add half cup of bitter orange juice (using same oranges of course), leave them over heat for another 15 minutes. Make sure to lift off formed foam. 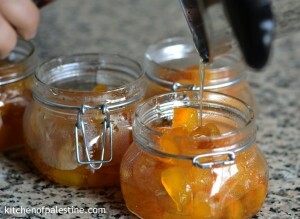 Place the marmalade into jam jars and keep them in the refrigerator. 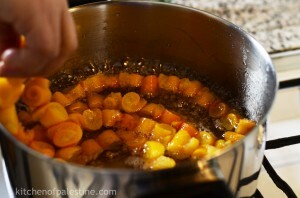 19 Comments on "Bitter Orange Marmalade (Mrabba Khesh-khash)"
This looks amazing! I will try it. 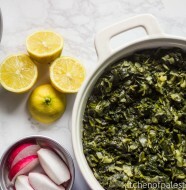 THANK YOU for the beautiful pictures and the details in the recipe! I do it with pleasure. Glad that you like it! Will be waiting your feedback..
My bitter orange is fruiting heavily for the first time this year. Your recipe looks perfect for my precious first crop. I will let you know how it turns out. Thank you! This is a really mouth watering recipe. Thank you for sharing it!! You are most welcome.. Thank you for stopping by! Assalaamu alaikum. Jazakallah for the yummy recipe! Yummmm! How awesome. Great instructions, thanks. And HELLO! from Seattle,! 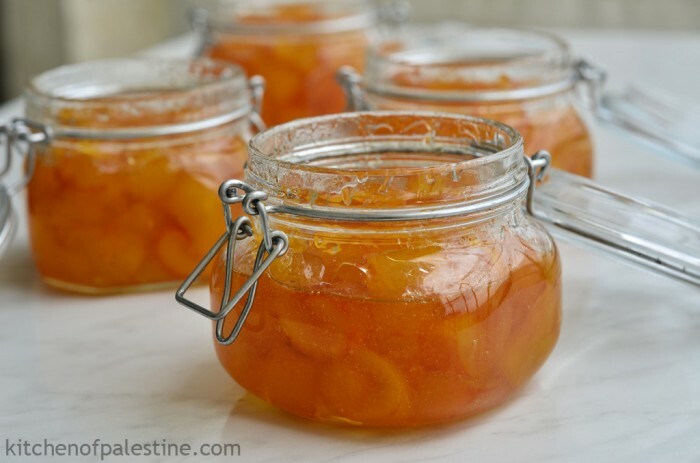 Wow, your marmalade looks great! It has such a nice colour! i cant wait to try it very soon! 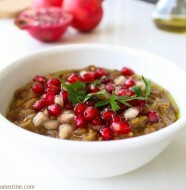 Today i have found you blog looking for an original baba ganoush recipe. thanks a lot! Thank you for your comment. Would like to know how it goes. Apologies for the late reply Sahar, I think you made them by now..
It’s better to be refrigerated for couple of hours until it cools down, but it’s not necessarily to be kept in the fridge. 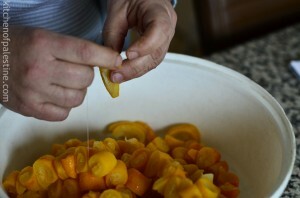 After trying it in for the first time in Bozburun, Turkey – I instantly fell in love with this marmalade! 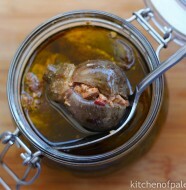 Personally, I haven’t tried your recipe yet, but I’ve shared it on my blog and have recommended it to many to try. I would love to post any related articles from guests. Looking forward to read your article.